The situation in Libya topped the agenda of meetings between President Abdel-Fattah Al-Sisi, Foreign Minister Sameh Shoukri and his Russian counterpart Sergei Lavrov during the latter’s two-day visit to Cairo this week. During his meeting with Lavrov on Saturday President Al-Sisi stressed that concerted action on the part of the international community was urgently needed to halt Libya’s slide into a spiral of conflict and that a peaceful settlement required dialogue between all Libyan rival parties. “One cannot denounce one party or praise another in the Libyan conflict. Without unconditional dialogue among all parties a settlement cannot be reached,” said Lavrov during a joint press conference with Shoukri following the meeting. Lavrov blamed the NATO alliance for the current crisis, saying the bloc’s 2011 campaign in Libya had resulted in “terrorism, conflict, illegal immigration and a host of other issues afflicting the country”, and called on the UN Security Council to try to reach a settlement via its envoy Ghassan Salamé. Shoukri said Cairo has always supported a political solution. “We have repeatedly emphasised the importance of inter-Libyan agreement, supported political agreements and backed the efforts of UN envoys to Libya. All parties should exercise self-restraint and work with the UN envoy to reach an agreement,” he said at the press conference. The self-styled Libyan National Army, led by Khalifa Haftar, last week began a military campaign to take over Tripoli, home to the UN-backed national unity government led by Prime Minister Fayez Al-Sarraj. 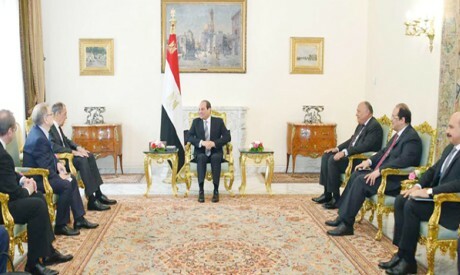 Bilateral ties, the Dabaa nuclear plant, the resumption of Russian flights to Red Sea resorts, and other pressing regional issues of mutual concern and security cooperation were also discussed during Lavrov’s meeting with Al-Sisi and Shoukri. Al-Sisi affirmed Egypt’s commitment to consolidating its economic, commercial and industrial partnerships with Russia, while Lavrov praised the level of economic, trade, scientific and technical cooperation between the two states. He said Moscow would continue to help development projects in Egypt within the framework of the comprehensive strategic partnership signed between the two countries in October 2018, during President Al-Sisi’s visit to Russia. Shoukri told journalists that he had reviewed the partnership agreements, and what has been achieved so far, with his counterpart. “The full implementation of these agreements requires time and effort and political will,” he added. During Lavrov’s two-day visit preparations for a possible Egyptian-Russian summit, to be held in Moscow in the summer, and the African-Russian Summit that will convene in Sochi in October, were also discussed. Egypt will attend the latter as both an African state and the president of the African Union. While President Al-Sisi called on Russian officials to end the ban on flights to Egyptian resorts — direct Russian flights to Cairo were resumed in April 2018 after a two-and-a-half-year suspension — Lavrov said work was underway to end the flight ban but added that some technical matters remained and it was not possible to set a precise date for the resumption. Russia suspended air traffic to Egypt in October 2015 after the downing of a Russian passenger flight from Sharm El-Sheikh killed all 224 people on board. Moscow and Cairo signed an agreement in 2015 for Russia to build a nuclear power plant at Dabaa, with Russia extending a loan to Egypt to cover the cost of construction. In December 2017 contracts for the construction of the Dabaa nuclear power plant were signed during Putin’s visit to Cairo. The issue of creating an area free from weapons of mass destruction in the Middle East was raised in the press conference by Lavrov, and the Palestinian crisis was discussed during meetings. Al-Sisi reiterated Egypt’s position that a two-state solution in accordance with international resolutions remained the best way to achieve peace in the Middle East. The partnership between Egypt and Russia is delineated by a 2+2 strategic consultation agreement, concluded in 2013, which includes the countries’ ministries of foreign affairs and defence. Egypt is one of just six countries to have signed such an agreement with Russia. The first meeting was held in 2014, attended by Al-Sisi, then minister of defence, and Nabil Fahmi, Egypt’s foreign minister, and their Russian counterparts Sergei Shoigu and Lavrov. The fourth round of Egyptian-Russian consultations within the 2+2 agreement was held in Moscow in May last year. Trade between Egypt and Russia reached $6.7 billion last year. A prospective Russian Economic Zone in the Suez Canal area is expected to attract investments of $7 billion, creating jobs and boosting industrial cooperation between the two states.